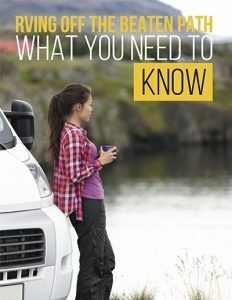 Because Wi-Fi and TV may be nonentities in campgrounds, old-fashioned board and card games claim renewed interest. 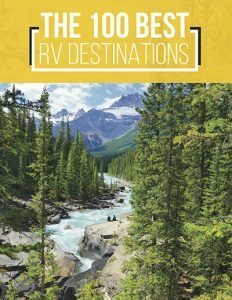 Here are some popular and cool games to play while RVing with friends and family. Decks of cards take up little room and require only a flat indoor or outdoor surface to play. UNO is a card game for all ages that is played with a deck of cards of its own. You can purchase this game at most discount or game store. It is fun for ages six and up. 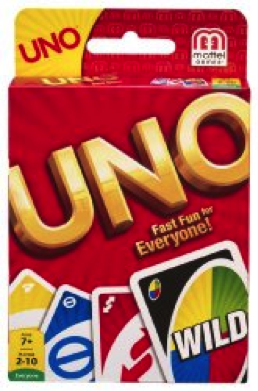 Uno rules are pretty straight forward and it can be played with as few as two or as many as ten players. Like UNO, Wizard has its own deck. It can be purchased any discount or game store. 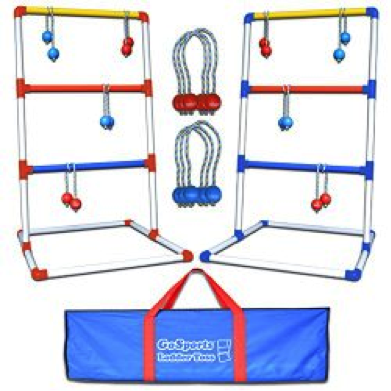 The rules are a little more complicated, but kids from eight to eighty find this fun and challenging. Rookies have as much chance of winning as any of the up to ten players. No game chest would be complete without a deck of Yahtzee cards. The game can be purchased at games stores, discount stores or online at Amazon.com. You can buy an official deck at discount, golf stores, or online. But you can play this game with an ordinary deck of cards too. The dealer position rotates from player to player around the table in a clockwise manner. The dealer changes with each deal. Each player is dealt four cards. He then arranges his cards face down to create a two-by-two grid. Players can look at the bottom two cards before placing them back on the table face down. From that point, players may not look at their cards unless play one of them. One card is turned face up from the top of the pile to form a discard pile. Players try to create a combination of four cards with the lowest point value. Aces are worth one point. Numbered cards have their value. Kings and queens are worth 10 points. A jack is worth zero points. This makes it the best card. Adjacent cards — in the same row or column — of the same value cancel each other and are worth zero points. Point totals are recorded at the end of each round. The game consists of nine or 18 hands. The player with the lowest point total at the end of the game wins. This is a great game for ages eight and up. Cards are dealt and the object of the game is to compete by spelling English words from cards in hand. The game starts with three cards and increases with each round. The eighth and final round has eleven cards. The game proceeds through drawing and discarding cards. The round is over when a player puts down a word, discards a card and has none left. The winner of the game is the person with the most points. 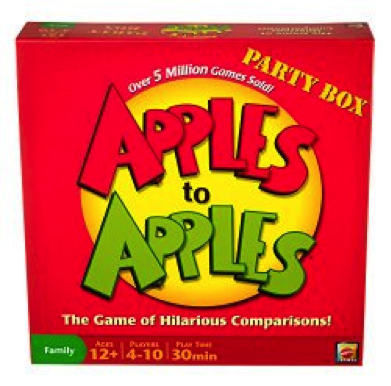 The Apples to Apples card game holds the interest of anyone learning to read or older. It is a great game to teach younger kids about words that go together. Players are dealt five to seven noun or noun phrase “red apple” cards. The Judge for the round selects an adjective “green apple” card. 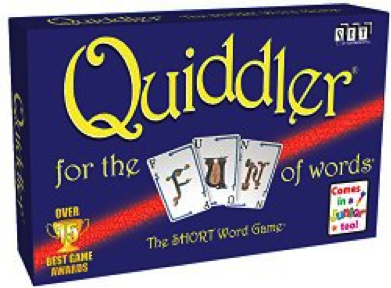 Players use the noun card they think is the best fit for that adjective. Players can justify why theirs is the best. The judge selects the winner of the round who is then judge for the next round. The game is suitable for of two ten individual players ages twelve and up or in teams with younger kids. This board game was popular with your great grandparents, but it has hit new popularity with youngsters who learned to play it on their iPads. 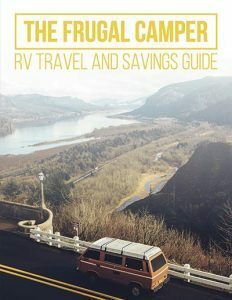 They can adjust to the real version, so tuck a folding board and a box of checkers away in the RV for this two-person game. Also an old game but rekindled by the digital version, a chess board and chess pieces will amuse two people eight and up for hours. Although it takes up more space, Monopoly in its many versions can be fun for the whole family for hours — and I do mean hours! If you are looking for a great active outdoor game then try Ladder Golf. This is a tossing game also called Ladder Toss. It can be played by two people or in teams of several people of all ages. You throwing bolas (two balls connected by a string) onto a PVC three-runged”ladder”. Each rung has a different point value. The object of the game is to get a bola wrapped around a rung on the ladder. The first team or person to achieve 21 points is the winner. Skill and experience count so make teams evenly balanced. 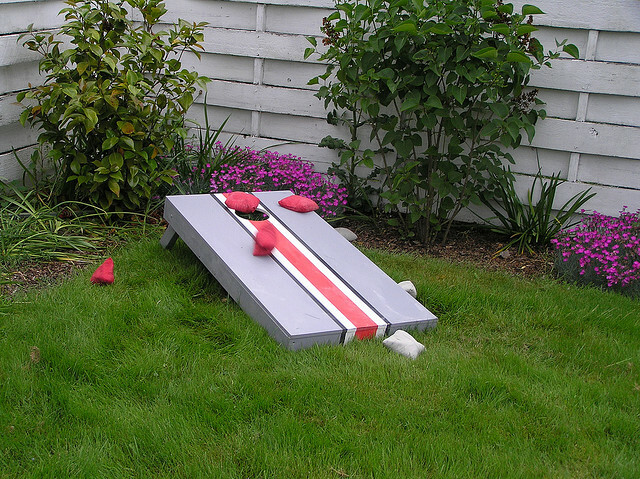 Another variation on horseshoes is Washer Toss, or Washer Pitch. This game uses ordinary metal two inch diameter hardware washers. Players score points by tossing the washers into a four inch diameter PVC pipe in a”pitching box” 16×16 inches. Plans to build the game and the rules for playing it can be found at washergameplayers.com. You can also buy the kit and avoid the building!